Blue Ice™ Fermented Skate Liver Oil is made in small batches with extraordinary care. We ferment livers from fish that have been wild caught in the Bering Sea and Aleutian Island regions of Alaska. Fermentation is a natural enzymatic and microbial action that releases the oil from the livers. 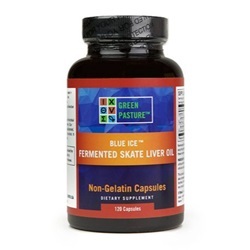 Our Fermented Skate Liver Oil is a raw, unadulterated whole food. Our Fermented Skate Liver Oil contains naturally occurring vitamins. The amounts of these nutrients will vary. It is also a natural source of Omega 3, 6, 7 and 9 Fatty Acids plus many important fat soluble nutrients. Q: How is Skate Liver Oil different from Fermented Cod Liver Oil? A: Skate is a cartilage fish that cannot grow bone. It is very closely related to sharks but are flatter in shape. The skate liver are sourced from same cold water region as our cod livers. We use the fermentation method to extract oil from both cod and skate livers. Our skate liver oil and cod liver oil both contain naturally occurring vitamins and omega fatty acids. Some practitioners find their patients do better on skate liver oil than cod liver oil. However, some people do better when they take a little bit of both. Q: Should I take Fermented Skate Liver Oil or Fermented Cod Liver Oil? A: We recommend that energetic or biofeedback testing be employed to help answer this question. We have found that some simply do better with skate oil than with cod liver oil. Generally speaking, taking a little bit of both is best. Skate is a cartilage fish, it cannot grow bone. Our understanding of how vitamin D and calcium are involved with cartilage formation is not yet fully completed. Our perspective is that each person is unique, and no two people can make any one conclusion without first investigating.